I just bought my first 1TB harddisk (Samsung HD103UJ). My first HD was a 100MB harddisk for my Amiga. That was roughly 18 years ago. 100MB was an insane amount at that time. Today, recoding one eposide of a TV show as MPEG 2 Transport Stream takes 13.6GB. Gigabytes! At PAL resolution! I wonder how long it will take until I can buy a 10 TB disk. My bet is 2013. Some follow up to yesterday’s post. Using a Sharkoon HDD Vibe-Fixer in a case which doesn’t require screws to install drives doesn’t work; the Vibe-Fixer consists of several independent parts which are only loosely coupled. So when the drive starts to work, you’ll hear a clatter between the U shaped Vibe-Fixer and the slot in the case. One solution would be to force some felt between the parts and the slot but it’s hard to get there and I’m not sure if the results are worthwhile. So I’ve bought a ichbinleise® Box HDD 10. This is basically a set of four aluminium pieces held together by four screws which keep the HD between two sheets of damping foam. The whole thing is then glued to the case with a thick foam piece to isolate the vibrations. I had to use hdparm -M 128 /dev/sda to switch the drive into silent mode, though, to reduce the noise to a low murmur. The main disadvantage of this setup is heat: I’ve applied some thermo transfer goo following a tip of the nice guys at ichbinleise.ch. Also, the HD case is in the flow of the front fan. Still the drive reports temperatures between 60°C and 80°C according to smartctl. I hope this is a bug but I’ll keep an eye on it. Does your computer sound like a F-15 turbine? Well, my old one did and after two years, I was really sick of it, so I decided to silence the beast. CoolerMaster CAC-T05 Centurion 5 case. The case is small, light and offers tool-less installation. Most stuff is clip-on. All edges are folded so you won’t cut yourself. Also, it doesn’t come with a power supply, which is good since I’m going to install my own anyway. Again a few bucks saved (and a considerable amount of waste). The case is produced for more than a year which tells to me: It’s a quality product that people still buy. Gigabyte GA-P35C-DS3R, Intel P35, FSB 1333, DDR2/DDR3. A high quality board with some room to upgrade for the next two years (for example, to DDR3 when the modules become as cheap as DDR2 is today or a Quad core CPU). Intel Core 2 Duo E6750, Dual Core, 2.66GHz, 4MB Cache, FSB 1333. Not the latest CPU but with a TPC (total power consumption) of 60 watts, easy to keep cool (which means you don’t have to buy the most advanced cooler). It’s the LGA775 socket version matching the mainboard. Here, I considered the E6650 (Dual Core, 2.33GHz) and the Q6600 (Quad Core). The smaller brother of the E6750 offers less bang for the buck and the Quad Core need insane coolers, right now. The board can take both, so I decided to go with the E6750 and wait for Intel to come up with a Quad Core with a TPC of less than 90. Asus EN8600GT Silent, 2*DVI, 256MB RAM, PCI Express x16. This board comes with a passive cooler. There is a second version with 512MB RAM but I don’t game that much and Blender runs comfortably with 256MB for my projects, so no need to waste any money on something I don’t need and that I’d have to cool down. Every component you install draws power which eventually gets converted into heat. The less, the better. One thing to note: This board gets hot and when I say hot, I mean skin-burning hot. While running 3D games, the temperature can reach 100°C. This is normal. The board and the chips on it have been designed for that kind of stress. Alas, the rest of your PC is not, so it is important to get that heat out. Unlike other components, RAM and hard drive don’t add that much to the concept so you can choose almost anything your dealer can deliver. I installed two Kingston HyperX DDR2 2GB kits (for a total of 4GB RAM) and a 500GB Samsung HD501LJ drive (SATA-II). The board does have an IDE slot but in order to keep the cable jungle in the case to a minimum, you should use SATA drives, especially for the DVD drive. I installed a Samsung WriteMaster SH-S203N. The tricky part is to select quiet components for the moving parts: Fans and power supply. For all other components, you should just select something which doesn’t drain insane amounts of power (because that directly translates into insane amounts of head which you have to deal with). ichbinleise® Power NT 500 Watt – the power supply. ichbinleise (“I’m silent”) is a company that has specialized into silent computers and components. The big plus: If they don’t have some part you need, they usually have something else which works equally well (or sometimes better because of new developments). Fan mounts made of soft silicon. A must have. Those keep the fans in place without screws and make sure the vibrations don’t cross over to the case. When you buy them, look for double tipped ones instead of ones with one flat side. The idea of the flat ones is that you have fingers which can bend by an arbitrary angle into any direction while you pull the ones behind the fan through the case and the holes in the corner of the fan. Just say no. The double tipped ones are much more easy to install (take the fan, pull them through, then easily pull them through the case from the outside) and if you can’t stand the tips standing out, just cut them off after the installation with a sharp knife. Arctic Cooling Freezer 7 Pro, Socket 775, 520g to keep the CPU cool. Easy to install if you follow the instructions. I didn’t. I still managed it, though. Note: You don’t need any thermo transfer goo for this cooler. It comes equipped with a pad. Arctic Cooling AF12025 Fan, 120mm fan for the back of the case. Pabst 8412N/2GLE fan, 80mm for the front. Zalman FanMate 2 Control, fan control to silence the 120mm fan. Sharkoon HDD Vibe-Fixer III to keep the hard disk away from the case (resonance control). You might be wondering about the amount of fans and the lack of case insulation. The latter suffers from two problems: If the case insulation is perfect, no noise will come out … and no heat, either. That means your PC will die of overheating in two minutes. If nothing in the case generates any sound you can hear, the insulation is futile. So the goal should always be to buy silent components and not to try to reduce the noise afterwards. So the amount of fans is not a problem as such. It quickly becomes a problem when the fans can be heard. To avoid this, I use two strategies: First, I install enough fans that no component ever gets so hot that any fan would have to run at top speed. The slower they can go, the more silent they are. If there is always a constant flow of air through the case, the fans stay silent, so that’s what I need. Secondly, I install quiet fans and use silicon fan mounts to make sure the inevitable vibrations of the fan can’t resonate with the case. Problem solved. In case you still hear something afterwards, the noise should be very quiet. Only then, you can consider adding a patch of insulation or two. But usually, the insulation only makes everything worse because it blocks the flow of air, gets in the way when you install components, etc. Furthermore, all these quiet components cost a few bucks. If one of them is broken and makes any sound, just throw it away and buy a new one. If you have never build a PC before, google the internet for some basic help. I’ll concentrate here on the major issues I ran into. Installation order is not a big deal. I’ve found it hard to squeeze the hard disk past the mainboard, though. There are two problems here: The case is for quick/toolless installation. This means the Viber-Fixer can’t be screwed into the 5 1/4″ slots. My solution was to screw the big dampers to the hard disk, then plug the tracks onto that and just stuff that into the middle 5 1/4″ slot. After locking this in place with the plastic lock of the case, the disk was held in place. Sure, it won’t stay there when you pull at it. But during normal operation, the drive won’t move – the forces of moving the tiny heads around inside are just too small. You should be careful when you drag the case around, though (lan parties, etc). If you fear that the drive might move, just tape some thick paper around the mainboard edge. That will prevent accidental short circuits. For the fans, install the silicon fan mounts in the fan, first and then position the fan inside the case to pull the other end through the holes in the case. This way, you don’t have to do insane finger contortions to pull the mounts through the tight holes of the fan inside the case. I plugged the fans into the fan plugs on the mainboard. You can connect them directly with the power supply but then, you’ll have to open the case to check on them. If you plug them into the mainboard, you can use software to check the fan speeds. I tried to install a silicon power supply mount, too. That didn’t fit since the case has two wide metal trays on which the power supply rests and one of them collides with the silicon. If it was present, the holes for the screws weren’t aligned anymore. But since the supply doesn’t generate and vibrations (maybe the fan is already isolated; I didn’t look inside), this is not an issue. You might consider to plug in all the case’s cables into the mainboard before installing the board itself. The cables from the front go into tiny pins at the bottom of the installed board and they can be hard to reach (especially after you installed half of them). An observatory has “first light” when they open the covers for the first time. Plugging in the power cord for the first time into your newly assembled PC is also a moment to remember. You plug in the power cord, flip the switch on the power supply and if you’re lucky … nothing happens. Today’s PCs don’t start when power comes up. So nothing to worry about so far. If the lights go out and you hear a pop or a hissing sound, chances are you just blew something. Congratulation. Next time, invest a minute or two to check all the cables a second time. This time, swear and curse and then look for a black patch and replace whatever got fried. So the big moment is when you press the big power switch at the front. At this time, it is advisable to have the case open because you’ll probably miss any acoustic cue that the PC is actually booting (unless there is no other noise). In my case, the fans didn’t even start which is always a bad sign. Note that today, PCs don’t usually start to smoke and burn if you did something wrong. After twenty years of cheap back-alley assembly, manufacturers have build one or two safety features in the components like plugs which either can’t be installed the wrong way or which simply don’t do anything if they are (so they don’t fry anything). To locate the problem, unplug everything from the power supply, remove all cards except the CPU and it’s cooler. Then start with the big 20pin power plug for the mainboard. Plug it in, try the switch. If the fan of the power supply doesn’t start turning, either there is a short circuit somewhere or it doesn’t get the signal from the power switch. Note: For the basic test, you don’t even need any RAM installed! Just the CPU, the CPU cooler (which doesn’t have to be plugged in; just keep the running time short in this case! Never start the system without a CPU cooler!) and the power supply is enough to check if the system is okay. In my case, I had missed a pin when installing the main power switch. After replugging it, the main fan showed me that the system was coming up. The front fan showed some erratic movements as did the CPU fan. Apparently, the mainboard only triggers them when needed. Nice. Depending on your needs, you should go through the BIOS setup to disable anything you don’t need. I didn’t need the serial and parallel port plus I switched the SATA connectors to AHCI for Linux. Time to boot from the DVD drive. My computer magazine came with an Ubuntu DVD for 64bit systems (which you need if you ever want to use more than 3.5GB of RAM; you can install more but you won’t be able to use it), so I have that a try. Since I have a big file server (1.5TB), I installed a smaller 300GB HD as the main drive and made a backup of all the data on it on the new 500GB drive attached via the eSATA bracket that comes with the mainboard. Ubuntu came up with no fuzz, mounted the old drive without problem. When I tried to use the partition editor on the new (external) drive, it crashed. Hm. Back to the command line. Unfortunately, there is no console installed. Okay, Alt-F2 works and xterm is there, too. So xterm it is. A few moments later, the second drive is partitioned with cfdisk, the filesystem is there (mkreiserfs) and rsync -avHPh ... (preserve all attributes, hard links, show some verbose progress in human readable format and continue partial files) starts to copy the files to the new, bigger home. Ten minutes later, the screen freezes. On the keyboard, caps- and scroll-lock start to blink; it’s a kernel oops (“Linux crashed”). Hm. That’s not nice. Did I fry the RAM while installing it? openSUSE comes with a memory test but that can’t find anything. So maybe a driver problem. Just to be sure, I do the procedure again and again, after half an hour, the system freezes with a blinking keyboard. This time, I had the kernel log open but the system hung before it could display the error. Also, there is no way to switch to a text console with the kernel output that I could find in a few moments. Well, Ubuntu, it’s been nice to meet you. Goodbye. Back to openSUSE. I’m using SUSE for 15 years, now, and I’m comfortable with the system. For some reason, Debian based systems hate me (dpkg usually corrupts its database with every second install that I try; did no one ever attempt to abort an install?). Maybe that’s why I couldn’t get Ubuntu to fly. Memory test shows that the RAM is probably okay, so it’s got to be a driver problem in Ubuntu. Trying to boot from a freshly burned openSUSE x86_64 DVD fails. Hm. In my old system, I can mount the DVD but the new drive won’t accept it. Strange. I can boot from the DVD but I can’t mount it later. Oh well, after connecting and setting up the network (ifconfig eth0 …ip… netmask 255.255.255.0) in the rescue system (another boot option with openSUSE), I just copied the ISO file over and unpacked it (mount -o loop openSUSE-10.3-DVD-x86_64.iso /mnt ; rsync -avP /mnt suse ; umount /mnt). Booting again and switching to “Source: Hard Disk” (F4). I didn’t specify anything when it asked from which hard disk; later, the installer will present me a list to pick from. The first thing in the installer is an error: It can’t find the installation repository. Well, yeah, I know. So I press return to close the dialog, select the keyboard and then “Start Installation / System”, “Start Installation/Update”, “Hard Disk”, select the right partition and the directory (“/suse” in my case). Houston, we have lift off. The rest of the installation is pretty standard. I suggest not to add any online repositories during the installation. I did once and the installer figured it was much more smart to download all 4GB again instead of using the local files. Duh. Instead of 10 minutes, the install took five hours. It seems the RAM didn’t work with the board after all. That would explain the random crashes I got with Ubuntu. I’d hoped that this kind of problem had been solved in 1994. Let’s see if my dealer takes the RAM modules back. I’m thinking about upgrading my RAID with 500GB disks. 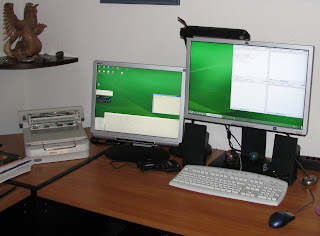 I now have a 3520 by 1200 desktop on two displays, 4GB of RAM and a Dual Core E6750 CPU. That means I can have Blender and a web browser open side by side or I can have my text editor jEdit, a thesaurus/dictionary and treeline plus a web browser open without any overlapping windows.